Rub the butter into flour, mix in finely mashed potato, sugar, yeast, cheese, thyme leaves and onion, sea salt and black pepper. Mix the warm water with the yeast and make a well in the middle and mix into a dough and knead for 5 minutes. Shape the bread either by making 2 loaves or 1 large loaf in the shape of a bloomer. Leave the dough to rise in a warm place until double the size, approximately 30 minutes. 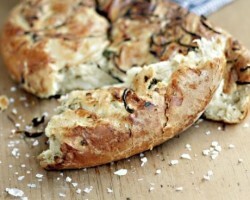 Brush the dough with milk and top with thin slices of onion and thyme leaves. Bake in the oven for 40 minutes or until cooked.